The Moss hybrid (watertube/firetube) boiler design ranges in size from 150 - 1,500 HP (51,750 lbs./hr.) and design pressures from 15 - 250 PSIG. 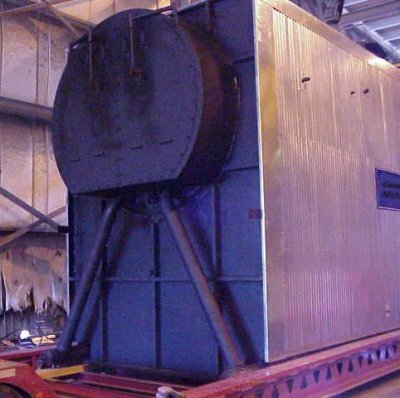 Our design is similar to the old HRT boilers that have been used for firing solid fuels for over 100 years but with several significant improvements. The radiant zone is located below the bottom of the HRT section of the boiler with the radiant tubes connected into the belly of the HRT section and sitting directly above the combustion zone. The Moss configuration has a large combustion zone that fires directly into the radiant zone of the boiler. This large radiant zone in the boiler is very similar to our watertube boiler because it promotes very low heat releases in the furnace and also because of the large amount of heating surface in this zone provides a high percentage of the steam produced by the boiler. Our three - pass design directs the flue gases through the boiler promoting excellent efficiency and quick response to swings in steam demand. The boiler pressure vessel incorporates a watertube water section in the radiant zone of the boiler and a two-pass HRT firetube pressure vessel in the convection zone. 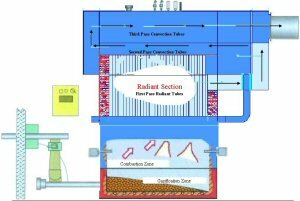 An automatic sootblower system is available as optional equipment and is strongly recommended for extended runtime between boiler tube cleaning. This boiler design also provides a large steam disengagement area (reduces the possible carryover of water from the boiler), large steam storage area (reduces the possibility of lowering operating steam pressure at times of severe steam demand) and a large volume of hot water that is stored in the vessel promoting fast responses to load swings. This boiler design can be used with all Moss combustion systems.